Nomadic seasons of farming adventures with nature thrown in to include; a pinch of family, snippets of friends, counting our blessings, paying IT forward, home school, and the spicy things I decide to rant about. Anyone having trouble relaxing tonight? Man, I am. I have from the beginning of this election campaign when Trump announced. I have always thought Trump was a 'mark' to hold the door open for the #GOP into the White House. A few years ago Hubby & I joked during the 2011 #WHCD. -- "What if Trump does run to make sure #Clinton has a chance? Do y'all remember all the negative publicity Trump brought to the GOP bolstering the DNC as the 'sane party?' Because of the nonsense with the birther movement. Hubby & I thought Trump would have a better chance than Romney as a national candidate. We talked about the idea of the DNC & RNC making a deal to get & keep both houses because there is more money to make there for corporations through repub-based legislation. Another plus would be the DNC taking a 3rd Dem Exec seat and later be known as a "save-face" after the economic crash. 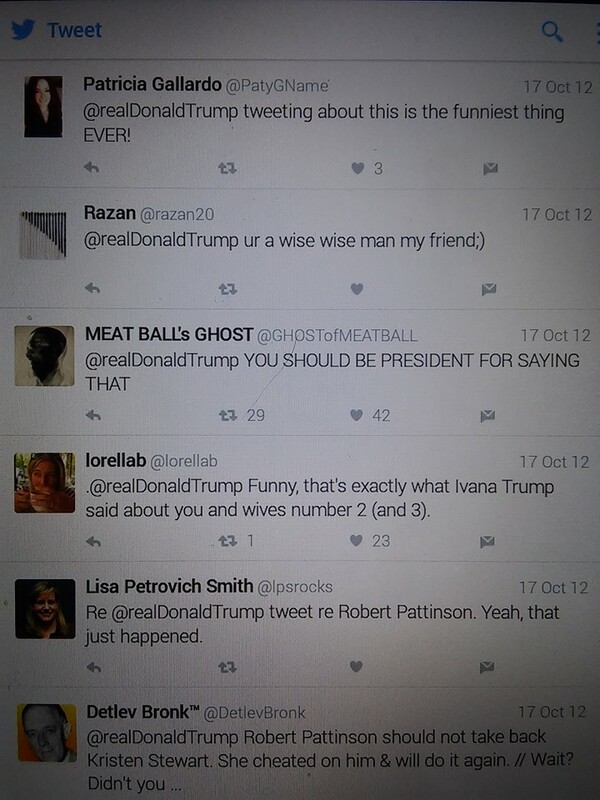 We were only joking and making 'what ifs' as we watch Trump grin and bear the ribbing from those at the podium. Anyone could see Trump's wheels turning in his head. Crazy thing is, we are not fans of Clinton. We both served our country during the Clinton era. No, thank-you because MrC compromised so much he was in the RNC pocket. Mrs is a ( Rep) in Dem disguise. She did not support many humanist goals I believe in as a voter. I told Nigel as my witness, I could not support her then. Sadly, I am still in that position along with hubby. Now with #Cruz dropping out after announcing his running mate in a weak attempt to garner more votes. We are stunned was he paid off or just 'suspend' so he could come in at a later time. #Kasich is suspiciously quiet after garnering what 8% in Indiana. Perhaps Priebus and deep pockets are scrambling now to work in a way to ensure a contested convention. Lets think about this folks, Cruz quit but why? This is what is running through my mind. Any ideas because the Crap is definitely not funny anymore. 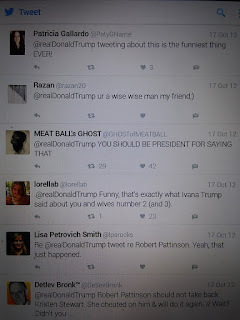 I will leave you with Meat Ball's Ghost's tweet in 2012 & blame him/ her for putting 'Trump as Pres' into the Twitterverse. I will spew such a font of information. FFS, Adam and Eve were not the first couple..... look up Lilith. The Bible is not a complete text and is so outdated it would not even run on a WINDOWS 95 machine. Christians appropriated history from many cultures check out what they did to the pagans. ALL 200 world Religions swallow up other religions they have conquered so, the victor writes the history books or the religious cannon. But people are people, we FOOK UP, We either follow rules adamantly, follow when necessary, choose what we follow, or say FOOK IT later to join the herd or just go off the beaten path. Really tired of the pushing other folks away just because what they choose to do with their life, pop a squat, choose to bump uglies with in the bedroom, put in or on their bodies, teach there children, cross a border or whatever fooking makes us different. For the love of humanity don't make me go nuclear. Our world is changing and I believe it is a great thing in many. I have met through social media many talented people as well as a few arses. It may be true even that for some social media keeps us apart while, for myself it does not. I actually learn more and meet folks online since we live in a very rural area and going into town daily is not feasible. Today, by chance through Twitter I found a Kick starter fund raising request for a new short film called "Scythe" by Jim Rothman. So, I am a noisy person and through asking questions found one of his brilliant films called "Minutes" on YouTube. It is only 17 minutes long and will gut you. People are flawed, we all have our prejudices. We often pre-judge others by the behaviors we 'usually' are guilty of as far as judgement mistakes. This is what stuck out for me. When sitting in the Clinic, Jacob (Rothman) sees a man (Michael McDonald) he passed judgement on before. This man, John turns his head and Jacob sees a sore on the back of John's neck. Jacob's physical reaction is palpable since, he may be viewing a piece of his own future. I am not going to give much away because the film is only 17 minutes. It is so worth your time to check it out. I will will use the film later as a discussion point for our sons about compassion. "Does it hurt?" asks Jacob. "Only the Solitude." answers John. I am going back to find his other work / films. Rothman's next project is 'Scythe' which, you can search for on Kick Starter's website by clicking the name in this sentence. Then type Scythe into the search menu. The last time I cried more than once over a celebrity was when I learned that Nina Simone had died, I was wiped out emotionally for awhile. Her music seem to just mirror all the things in my heart and soul were experiencing. David Bowie was a kick in the gut as well and I mourned. Prince's death is the one that actually made me cry -- the ugly cry. I am usually pretty good at compartmentalizing to keep my bipolar mood swings in check. If I opened my mouth I would have been a puddle on the floor on Thursday. I just did not want to share how much his art and music meant to me. I usually do not geek out and follow actors, writers, or artists. 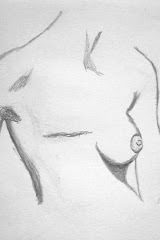 Don't get me wrong I love music, books, movies and all forms of art. There was just something unique in his vision. I was in actual shock though when hubby told me on 4/21/16 that he was dead and glued myself to the news. Man, the wind was sucked right out of me. He was controversial because of his lyrics and music to many folks. To me however, he was a liberator, an artist's artist, poet, and musical genius. His talent playing the guitar and piano incomparable to no other. I am in mourning for America. Now for the other offerings are 4 channels with business news, 2 weather channel, 2 channels to cover the House and Senate. No wonder Americans are so uninformed. Our news broadcasts have become a pop culture and entertainment industry. There is no place on our cable (DIRECTV network) to check in for information based upon empirical fact-based information. I miss the day of NPR, Current, and now sadly Al Jazeera-America. I will not bow down through and become a mindless drone that is spoon-fed information by entertainers as fact. I will go to other sources to stay informed about my community, national issues and our world. For the record, I am teaching our sons how to find information using the internet. I just hope those who take the time to read; do the same. We are still around and staying out of trouble. Hubby retired in November 2015. January, Lisa moved into an apartment in San Antonio, is currently working and going to college. Saenz is nearing graduation from high school. Zephyr will start the 6th grade. So what are we going to do with all our time as a family? Same as always more reading, writing, learning and some gardening. I plan to start writing again upon graduation. I seriously hope your coops are doing well in your slice of heaven. I can be found on Facebook, Instagram and Twitter. Crock Pot Sunday, Cubby lends a hand. One of the things I love about this time of year is cooking warm meals of stew, soup, chili, or crock pot favorites. This is cubby stirring shrimp into the gumbo after he helped me clean them. 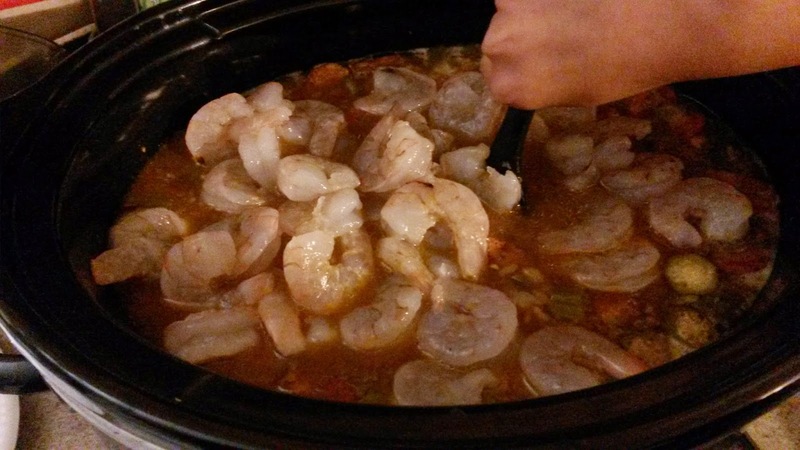 He has gotten the knack of 'pinch & pull' when detailing and shelling shrimp and crawfish. He has been a helper in our kitchen since he was in diapers. The best way to combat picky eaters is getting them to: plan, shop, chop, cook, and clean. I hope ya'll are having a wonderful week. Can you believe next week is Thanksgiving? We usually just do a in-ground roasted turkey with a few sides and dessert. Have you got all your holiday shopping done? I am happy to say that I have finished all the boys gifts. Thank You! internet. I don't do Black Friday because it is so not worth the hassle. We still have not found the cat from our last post but, we keep looking for it. Sad thing is, I am afraid it has died by now without the neighbor finding it. Our neighbor works extremely late into the night and is gone most days before sun-up. So I am sending a little positive energy into the universe hoping he was able to free himself. How are ya'll enjoying The Walking Dead or American Horror Story? My favorite character this season is Carol. I am glad to see her transition into a 'hard-nose survivor.' Most of the time I am on team Rick or Michonne. I currently have all ten hard bound copies of the entire comic series and usually reread them all throughout the year. On American Horror Story, Twisty the Clown is already dead but, I still am enjoying this Freak Show season mainly because of Jessica Lange, Frances Conroy, Angela Bassett, and Kathy Bates; those women rock the show each season. So, what are ya'll looking forward to in the new year? STUPID PEOPLE PISS ME OFF!!! Nothing makes my men smile like landing a whopper. Saenz was busy pulling in catfish. How is your weekend going? Hard Headed, 20 yr AF veteran, married, and enjoys the simple things in life. I may not be a Republican, Democrat, Independant or Liberitarian but, I am a registered voter who VOTES. This blog is just random writing, ranting, voicing disbelief over folks not reading or doing stupid things and our family life.